West Side Youth Basketball & Cheer registration is open for ages 4 (by June 1) to grade 6 girls basketball, grade 8 boys basketball, and grade 4 for cheer. No child is turned away and all school districts are welcome to join our classic league and cheer! Register online or at one of our live sign up dates! 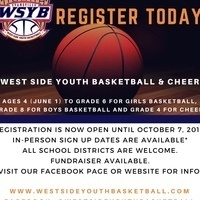 Visit www.westsideyouthbasketball.com or Facebook @westsideyouthbasketball for more info! USI students and employees must use MyUSI.